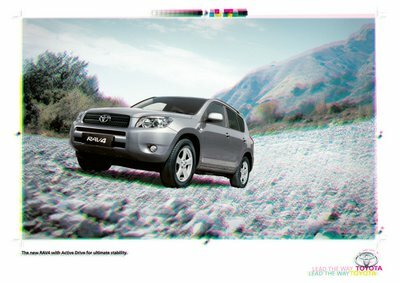 This is an interesting ad done by Agency: FCB, South Africa. The copy reads "The new RAV4 with Active Drive for ultimate stability." It is actually rare to find such a smart art execution which explains the product benefit better. Smart job! I can understand this bcoz i am from the design field. How is a layman supposed to understand this ? Creativity v/s effectiveness - the battle rages on !!! It's great! I really like this one. But it's also classic I guess.